European Researchers’ Nights are public events dedicated to bringing researchers closer to the public. They showcase the diversity of research and highlight the impact of research on our daily lives. The aim is also to motivate young people to embark on research careers. The events promote how researchers contribute to our society by displaying their work in an interactive and engaging forum. From 2018-2019, 55 projects have been implemented in 371 cities across Europe and beyond. During the 2018 Night, over 1.5 million of visitors attended! In 2019, the events will take place on Friday, 27 September*. This year’s call for proposals has closed. The call for the 2020 edition of the European Researchers’ Night will be published on 8 October 2019, with a deadline of 9 January 2020. *Please note that the event will take place in Israel on Thursday 19 September. European Researchers’ Night grants may be awarded to any legal entity established in an EU Member State or Associated Country. Legal entities involve the coordination of activities between local, regional, national or international partners. Possible beneficiaries’ profiles may include private and public research organisations, companies, public authorities, schools, science museums, parent-teacher organisations, EU mobility centres for researchers, foundations or the media. Any activity or event that boosts public awareness of the positive role of research in society – particularly among young people – is eligible for funding. EU-funded researchers are encouraged to contribute and interact as much as possible with visitors by displaying their projects and promoting the use of research. The value of grants varies according to the scale of the events proposed. All projects are selected through an open, independent and transparent evaluation. The competition uses a series of pre-determined criteria (listed in the call for proposals). Organisations must submit a proposal in reply to the call for proposals. The European Researcher’s Night’s call is available via the “Get funding” page of this website. 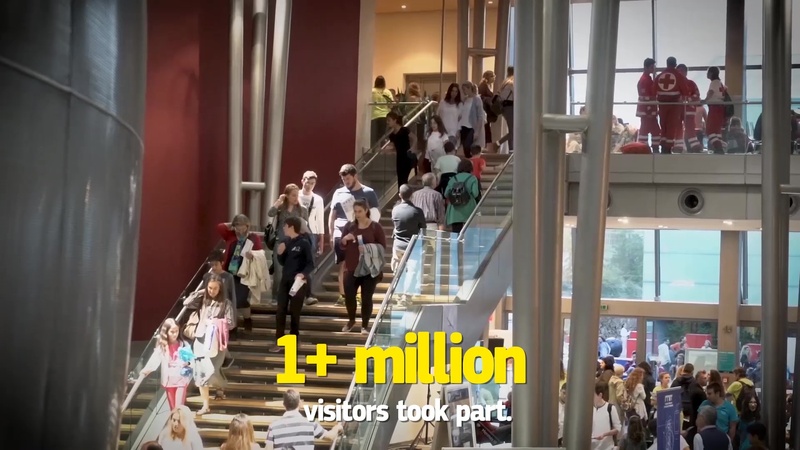 …as 1.5 million visitors did in 2018! Learn how research is fighting cancer, stopping global warming, preventing hunger and drought, improving technology to assist disabled persons and tackling challenges for life in space. Meet researchers and discover the fascinating work of science in a fun and interactive environment – with family, friends, your school or on your own. See the event closest to you on the interactive map below. Applying for my own research funding was an important step for my research career. Having completed one postdoctoral position already, I needed to be able to demonstrate my potential to attract research funding. The Marie Curie fellowship was an excellent opportunity to do this and they substantially increased the likelihood of both future funding and a permanent research position down the line. The Marie Curie Actions fellowship gave me the scientific and financial independence to achieve this project and provided me with enough resources and flexibility to convince me that the move could work not only for my career, but also for my family. The Marie Curie Actions fellowship does not only help me to define myself as a distinguished specialist, it will also enable me to establish my own research group in the near future and develop excellent cooperation with world leading research institutions. Studying physics and work on science is my biggest childhood dream. The Marie Curie Actions represent one of the best opportunities I had to make it come true. My Marie Curie Actions Reintegration Grant covers my research costs and it allows me to develop personal projects while integrating in a research team already in place. I realized that a Marie Curie grant would provide my projects with substantial momentum given the large flexibility the funding allows in using the money. The prestigious Marie Curie grant allows me to learn new techniques and will add valuable publications to my CV. I am confident that my improved professional profile will open new opportunities in the competitive scientific job market. When I started to prepare my Marie Curie fellowship application, I felt it could represent a unique opportunity, not only for the development of my scientific career but also for my life in general. My Marie Curie fellowship has so far allowed me to choose a research topic to which I had had no previous exposure, but which I was fully scientifically ready to tackle, and to start making my own way towards producing original results. I decided to apply for a Marie Curie fellowship mainly because I wanted to experience a different research environment and extend my research network. The Marie Curie Actions Intra - European Fellowship was on top of my priority list of fellowships due to its prestige, attractive mobility allowances as well as the networking and support benefits it proposes. I applied for a Marie Curie fellowship a few months after I defended my thesis. I was working on fundamental aspects of the physics of materials, investigating how materials break, from the atomic to the macroscopic scale. This study inspired me many ideas on how to design stronger materials.